A global agency that sets rules for the seas is studying the environmental effects of more and more rocket stages that may contain toxic fuel dropping into the world's oceans. The International Maritime Organization's concern comes after Inuit groups expressed anger over Russian launch stages splashing down in Canadian waters hunters depend on for food. It also follows research detailing a satellite industry growing worldwide despite little understanding of its consequences. “Right now we are just starting an information-gathering phase,” said Linda Porebski, a senior Environment Canada official who heads one of the maritime group's scientific bodies, which has just met in Vancouver. “We can't get very far in terms of knowing exactly what's going to be launched, how much of that is going to come down in the oceans, what material it's going to be carrying, how much excess fuel,” he said. Greenpeace decided to dig into the issue in 2017 following Inuit concerns that a Russian-launched rocket carrying a satellite owned by the European Space Agency would drop a stage in the North Water Polynya, one of the Arctic's most biologically productive areas. Documents released under access-to-information laws suggest there have been others. A launch site in French Guiana also uses trajectories that drop debris in the Arctic. “Residual hazardous fuel may still be in tanks on re-entry,” the documents say. They list 39 sites around the globe. Santillo's research found at least 30 companies sending satellites into orbit, some with plans for weekly liftoffs. A company in Canso, N.S., has applied to launch hydrazine-fuelled rockets. 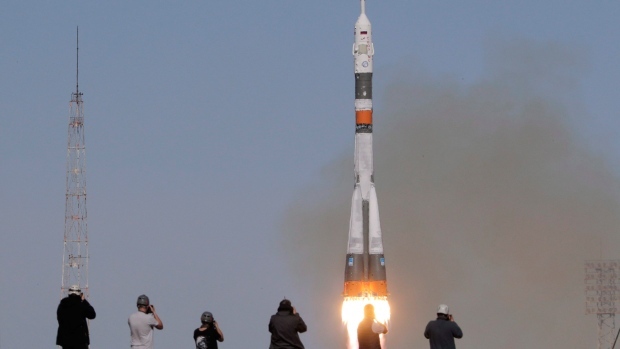 Research from Russian launch sites suggests some fuel does reach the water's surface. Porebski said her group has requested information from governments as well as international bodies involved with space. She said it's hoped there will be preliminary data by June. Santillo said the space industry is the only one left using oceans without any kind of regulation. Now's the time to reconsider, he said.